President Muhammadu Buhari has urged Nigerians to rise above personal, group, sectarian and other interests, and promote harmony and tolerance among themselves at all times. In his Sallah message, Buhari urged all Muslims to use the occasion for sober reflection and self-examination, and strive to be good ambassadors of their religion by upholding high moral values. He reminded Muslims that this felicitous occasion of Eid el-Adha is a remembrance of the submission of Prophet Ibrahim Alaihis-Salam to Allah, his Creator, by which he taught the world the value of sacrifice in relating with one another, and when it comes to nation-building. 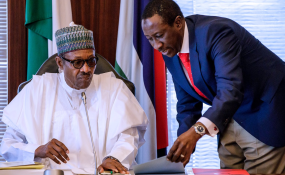 "We must sacrifice for others and remember always those who are less fortunate than ourselves," Buhari said in the message issued by his Senior Special Assistant on Media and Publicity, Malam Garba Shehu. The president said religion is a major factor in influencing human behaviour towards good conduct and actions. On the current economic challenges facing Nigerians, the President reassured them that such are temporary because the welfare of the people is the main thrust of the change agenda of the administration.